Ovide Decroly > Onderwijsinnovatie > Waar haalde Finland de mosterd voor zijn hoogstaand onderwijs ? The Finns readily admit they did not invent much of their pedagogy. They credit borrowing from the United Kingdom, Canada and the United States. Their literature frequently credits the Association for Supervision and Curriculum Development (ASCD) for many of the resources used for the development of programs. 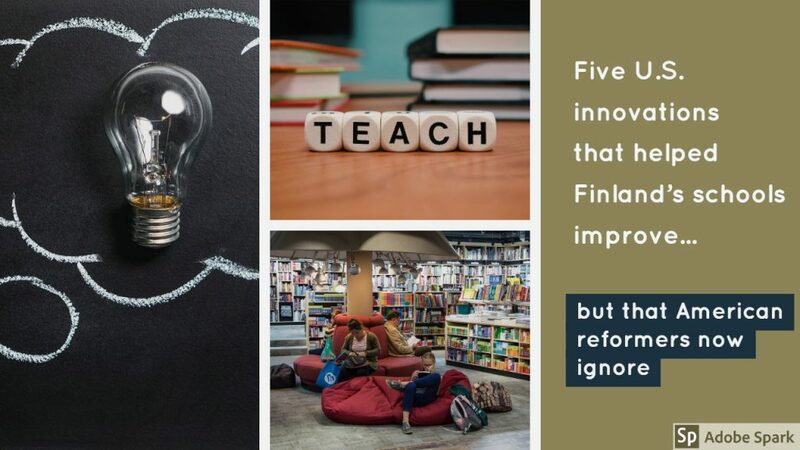 ASCD headquarters are in Alexandria, Va.
Enkele jaren geleden publiceerde Valery Strauss (juli, 2014) in ‘The Washington Post’ een bijdrage over ‘Five U.S. innovations that helped Finland’s schools improve but that American reformers now ignore’. Een synthetische en heldere bijdrage over onderwijsvernieuwing. It is interesting that, according to the OECD, the United States exhibits only modest innovation in its education system but, at the same time, it is the world leader in producing research, practical models and innovation to other countries. Dewey’s philosophy of education forms a foundation for academic, research-based teacher education in Finland and influenced also the work of the most influential Finnish scholar professor Matti Koskenniemi in the 1940s. All primary school teachers read and explore Dewey’s and Koskenniemi’s ideas as part of their courses leading to the master’s degree. Many Finnish schools have adopted Dewey’s view of education for democracy by enhancing students’ access to decision-making regarding their own lives and studying in school. Unlike in most other countries, cooperative learning has become a pedagogical approach that is widely practiced throughout Finnish education system. Finland’s new 9-year comprehensive launched in early 1970s was built on an idea of regular small-group learning of students coming from different family backgrounds. Howard Gardner’s Theory of Multiple Intelligences became a leading idea in transferring these policy principles to school practice. Again, the 1994 National Curriculum emphasizes that school education must provide all students with opportunities to develop all aspects of their minds. Without frequent standardized and census-based testing, the Finnish education system relies on local monitoring and teacher-made student assessments. A child-centered, interaction-rich whole-child approach in the national curriculum requires that different student assessment models are used in schools. Research and development of system-wide educational reform and change hasn’t belonged to the academic repertoire of Finnish academia. The number of research papers related to that field has therefore remained minimal. Instead, Finnish education experts have relied on foreign sources of expertise and knowledge. A good example of an innovation designed in the U.S. is peer coaching that evolved in the 1980s and 1990s as a result of research and development work of Bruce Joyce and his colleagues.